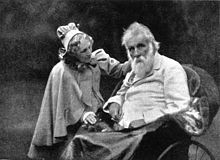 George MacDonald (December 10, 1824 – September 18, 1905) was a Scottish author and Christian universalist minister most famous for his poetry, fairy tales and fantasy novels. But for life there could be no death. If God were not, there would not even be nothing. Not even nothingness preceded life. Nothingness owes its very idea to existence. Never be discouraged because good things get on so slowly here; and never fail daily to do that good which lies next to your hand. Trust to God to weave your little thread into the great web, though the pattern shows it not yet. I think the reason children get tired of their toys so soon is just that it is against human nature to be really interested in what is of no use. If you say that a beautiful thing is always interesting, I answer, that a beautiful thing is of the highest use. Is not the diamond that flashes all its colours into the heart of a poet as useful as the diamond with which the glazier divides the sheets of glass into panes for our windows? I record the conviction that in one way or another, special individual help is given to every creature to endure to the end. It has been my own experience, that always when suffering, whether mental or bodily, approached the point where further endurance appeared impossible, the pulse of it began to ebb and a lull ensued. You are tender-hearted, and you want to be true, and are trying to be; learn these two things: Never be discouraged because good things get on so slowly here; and never fail daily to do that good which lies next to your hand. Do not be in a hurry, but be diligent. Enter into the sublime patience of the Lord. Trust to God to weave your little thread into the great web, though the pattern shows it not yet. When God's people are able and willing thus to labor and wait, remember that one day is with the Lord as a thousand years, and a thousand years as one day; the grand harvest of the ages shall come to its reaping, and the day shall broaden itself to a thousand years, and the thousand years shall show themselves as a perfect and finished day. What we call evil, is the only and best shape, which, for the person and his condition at the time, could be assumed by the best good. Why are all reflections lovelier than what we call the reality? — not so grand or so strong, it may be, but always lovelier? What distressed me most — more even than my own folly — was the perplexing question, How can beauty and ugliness dwell so near? "But tell me how it is that she could be so beautiful without any heart at all — without any place even for a heart to live in." "I cannot quite tell," she said; "but I am sure she would not look so beautiful if she did not take means to make herself look more beautiful than she is. And then, you know, you began by being in love with her before you saw her beauty … But the chief thing that makes her beautiful is this: that, although she loves no man, she loves the love of any man; and when she finds one in her power, her desire to bewitch him and gain his love (not for the sake of his love either, but that she may be conscious anew of her own beauty, through the admiration he manifests), makes her very lovely—with a self-destructive beauty..."
Afterwards I learned, that the best way to manage some kinds of painful thoughts, is to dare them to do their worst; to let them lie and gnaw at your heart till they are tired; and you find you still have a residue of life they cannot kill. There is no cheating in nature and the simple unsought feelings of the soul. There must be a truth involved in it, though we may but in part lay hold of the meaning. All that man sees has to do with man. Worlds cannot be without an intermundane relationship. The community of the centre of all creation suggests an interradiating connection and dependence of the parts. Else a grander idea is conceivable than that which is already embodied. Benefits conferred awaken love in some minds, as surely as benefits received in others. It is better, a thousand-fold, for a proud man to fall and be humbled, than to hold up his head in his pride and fancied innocence. I learned that he that will be a hero, will barely be a man; that he that will be nothing but a doer of his work, is sure of his manhood. I knew now, that it is by loving, and not by being loved, that one can come nearest the soul of another; yea, that, where two love, it is the loving of each other, and not the being loved by each other, that originates and perfects and assures their blessedness. I knew that love gives to him that loveth, power over any soul beloved, even if that soul know him not, bringing him inwardly close to that spirit; a power that cannot be but for good; for in proportion as selfishness intrudes, the love ceases, and the power which springs therefrom dies. Yet all love will, one day, meet with its return. All true love will, one day, behold its own image in the eyes of the beloved, and be humbly glad. This is possible in the realms of lofty Death. Till we can and do obey. ...the regions where there is only life, and therefore all that is not music is silence. Great Love speaks in the most wretched and dirty hearts; only the tone of its voice depends on the echoes of the place in which it sounds. Diamond, however, had not been out so late before in all his life, and things looked so strange about him! — just as if he had got into Fairyland, of which he knew quite as much as anybody; for his mother had no money to buy books to set him wrong on the subject. the swelling, of the fresh life within, that withers and bursts the husks. God hides nothing. His very work from the beginning is revelation, — a casting aside of veil after veil, a showing unto men of truth after truth. Afflictions are but the shadow of His wings. Of all fairytales I know, I think Undine the most beautiful. A genuine work of art must mean many things; the truer its art, the more things it will mean. A meaning may be there, but it is not for you. If, again, you do not know a horse when you see it, the name written under it will not serve you much. The greatest forces lie in the region of the uncomprehended. One difference between God's work and man's is, that, while God's work cannot mean more than he meant, man's must mean more than he meant. My tales may not be roses, but I will not boil them. The natural world has its laws, and no man must interfere with them in the way of presentment any more than in the way of use; but they themselves may suggest laws of other kinds, and man may, if he pleases, invent a little world of his own, with its own laws; for there is that in him which delights in calling up new forms — which is the nearest, perhaps, he can come to creation. When such forms are new embodiments of old truths, we call them products of the Imagination; when they are mere inventions, however lovely, I should call them the work of the Fancy: in either case, Law has been diligently at work. A fairytale, like a butterfly or a bee, helps itself on all sides, sips at every wholesome flower, and spoils not one. The true fairytale is, to my mind, very like the sonata. We all know that a sonata means something; and where there is the faculty of talking with suitable vagueness, and choosing metaphor sufficiently loose, mind may approach mind, in the interpretation of a sonata, with the result of a more or less contenting consciousness of sympathy. But if two or three men sat down to write each what the sonata meant to him, what approximation to definite idea would be the result? Little enough — and that little more than needful. We should find it had roused related, if not identical, feelings, but probably not one common thought. Has the sonata therefore failed? Had it undertaken to convey, or ought it to be expected to impart anything defined, anything notionally recognizable? "But words are not music; words at least are meant and fitted to carry a precise meaning!" It is very seldom indeed that they carry the exact meaning of any user of them! And if they can be so used as to convey definite meaning, it does not follow that they ought never to carry anything else. Words are like things that may be variously employed to various ends. They can convey a scientific fact, or throw a shadow of her child's dream on the heart of a mother. They are things to put together like the pieces of a dissected map, or to arrange like the notes on a stave. That which is in a man, not that which lies beyond his vision is the main factor in what is about to befall him: the operation upon him is the event. All is loss that comes between us and Christ. This page was last edited on 14 August 2017, at 12:03.